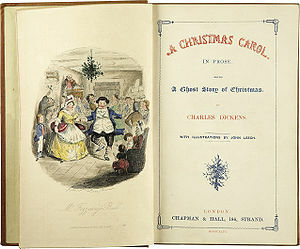 A Christmas Carol was first published by Chapman & Hall (a company that was subsequently owned by Wolter Kluwer who I worked for many years later – small world!) on the 19 of December 1843. It tells the story of a miserly old man Ebineezer Scrooge who following a visit from his dead business partner Jacob Marley and the Ghosts of Christmases Past, Present, and Yet to Come, changes his whole attitude towards Christmas, money, people and ultimately life. What is interesting is that Scrooge was not born a miser, there was a time when he was young and in love, he was to be married to his fiancée Belle. Yet because of his desire for wealth, a thirst for money that could never be satisfied and his workaholic lifestyle she married another. This together with the way he was treated by his father and the death of his sister Fran are provided as events that turned Scrooge into a tight fisted, cold hearted and greedy man. He met Jacob Marley whilst in apprentership probably as an accountant (I started my career in an accountancy practice!) They formed Scrooge and Marley a nineteenth century financial institution; they were bankers who made money from lending to others at very high rates of interest. They cared little for the people they lent money too, only that they turned a profit. One can only assume that modern day bankers never read A Christmas Carol. If Fred (the shred) Goodwin had been gifted this book as a small child, perhaps RBS would never have posted their £24.1bn record breaking loss, and if some people are to be believed the financial meltdown in the UK would have been far less sever, but I digress. It could be argued that Scrooge was a victim of his upbringing, he could not change, it was who he was and that is how he would always be. Yet when shown key events from his past and present and what would happen should he continue to behave the same, he decided to change. Change his behavior, change his attitude, change who he was, and he did it overnight! Okay being visited by three terrifying ghosts that vividly portray how your entire life has been selfish and pointless might be considered a drastic measure. But it shows that if you want to do something, you can. If the motivation is strong enough, wherever that motivation comes from, you can do whatever you want. So as 2010 comes to an end think back over the past twelve months, have you achieved what you wanted, are you happy with where you are now and where you might be going if you continue to do the same things, If not, then change. You don’t need to make massive life changing decisions as Scrooge did. Small behavioral changes can be just as effective, studying before you go to work rather than after work might help you absorb more and improve your concentration. Start using mind maps and colours when preparing your notes, this will help make them more memorable. Even before you begin to study a new subject take a look at the exam question and have a go at it, you might be surprised how well you do. And if you can’t do it nothing is lost, at least when you come to look at the text you will have an idea as to what to pay more attention to. On many levels Scrooge was very successful, he was driven, motivated, single minded, ruthless and rich. I am sure if he went on the apprentice he would win! But perhaps his greatest s skill was that he was able to change. This entry was posted in Confidence, Motivation, Success and tagged Mind Maps, Motivation. Bookmark the permalink.